We've finished our 2008-2009 year and have completed our second year as Brownies, and our third year as Girl Scouts. Our troop has been recognized as an honor troop again for the third year as well. Congrats to the girls for all their hard work. Read about our meetings in the Brownie Blog and view our Photo Gallery to remember all we've done. We will miss being the girls leaders going forward. Kalie has moved to California, and Sylvia (and daughter Sarah) moved locally across town and are now part of Troop 6142. We have all enjoyed scouts and cherish the memories we've made together over these past years. 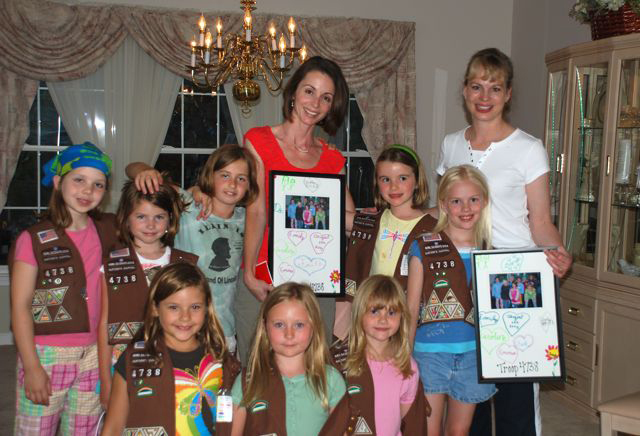 We're glad to welcome troop moms Jan and Kelly as the new leaders for the troop beginning in the fall 2009. 2012 Update: Sylvia has a new troop 1138 here. Come visit! - and to live by the Girl Scout Law. - be a sister to every Girl Scout.